This was supposed to be the family lunch for 4. Then it became the family lunch for six. Then the family lunch for 6 became the extended family lunch for 12. Now it’s lunch for 20. Since it’s hot today, and very humid, dessert consists of gorgeous stone fruit (OMIGHAAAAD the peaches and nectarines are so wonderful this year!). This is what get served with coffee. 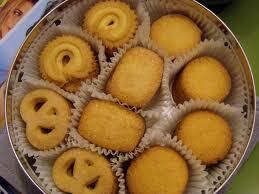 Emergency Danish Butter Cookies. Why? Seriously, with the way I rabbit on about eating cookies, and drinking coffee do you REALLY think I’d have any cookies on hand? BWAHAHAHAHAHA! ‘Scuse me while I go finish off making the Festive Tunisian Carrot Salad for 20. « Cookies + Coffee = 44 Days of Holiday Cookies Day 34: Open Sesame!